Origin and Habitat: It is rather widespread in northern Namaqualand, Cape Province, South Africa. Habitat: It grows usually in dense and localized colonies on flat surfaces or in the hollowed rocks, sometimes on quartz fields. 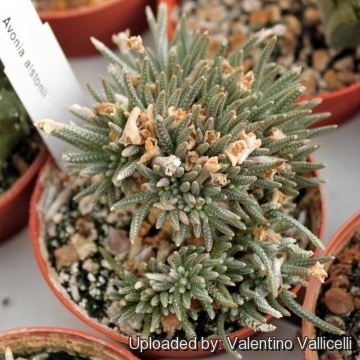 Anacampseros quinaria E.Mey. ex Sond. 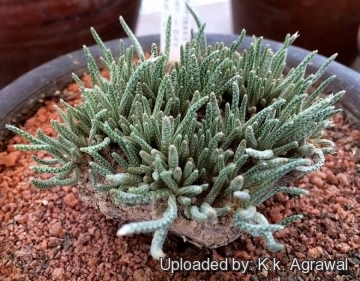 Description: Avonia alstonii is a dwarf perennial caudiciform plant with a large, turnip-shaped rootstock buried to its rim, surmounted with myriads of silvery white stems, flush with the ground. 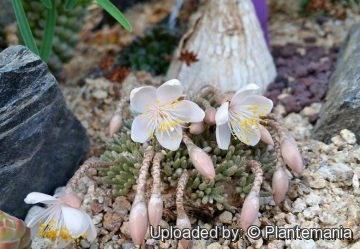 The flowers are delicately shaded with pale pink and the largest of the Avonia section. It is considered the showiest of all avonias. Caudex (rootstock): Turnip-shaped with a spherical crown, above ground (often pulled down into the ground in time of drought), flattened above, 2 to 8 cm in diameter, given some decades. 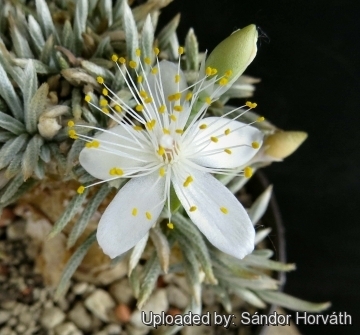 However some exceptional plants found in nature exceed 15 cm in diameter and could be several centuries years old. Branches: Very numerous radiating from rootstock, up to 2 mm thick and 2-3 cm long. Leaves: Reduced to a smooth ball each subtended and concealed by a stipule, but in 5 rows on the stem. Flowers: Usually white or in shades of pink, solitary, about 3 cm in diameter. Stamens to 60. 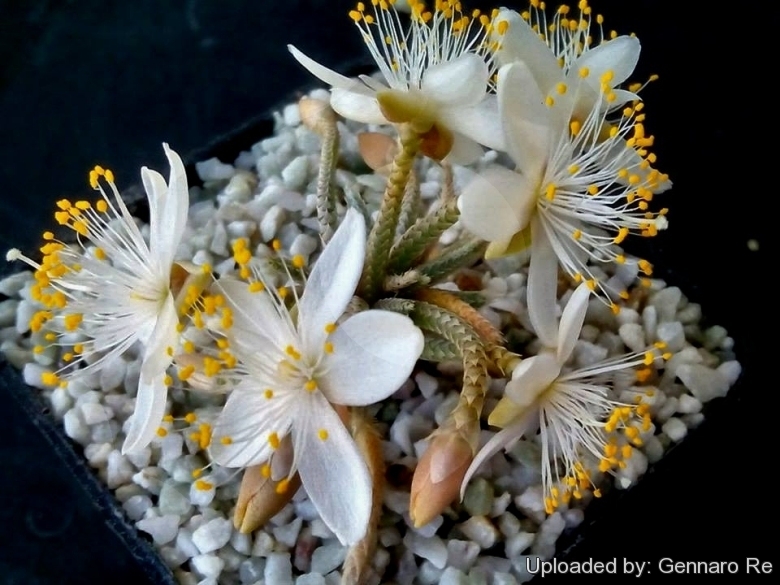 It's self-fertile, and it can only be reproduced by seeds. Fruit: Capsule to 7 mm. Seeds: Very fine-grained light brown seeds. Avonia quinaria (E.Mey. ex Fenzl) G.D.Rowley: (subsp. quinaria) Flower purple, 1,2-1,5 cm in diameter, leaves in a spiral. 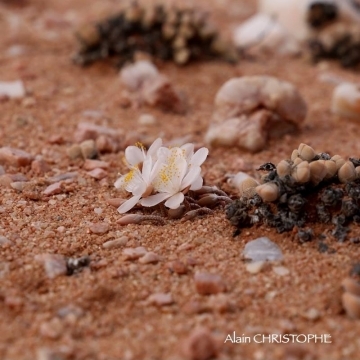 Distribution: South-eastern Namibia to Bushmanland and north-eastern Namaqualand. 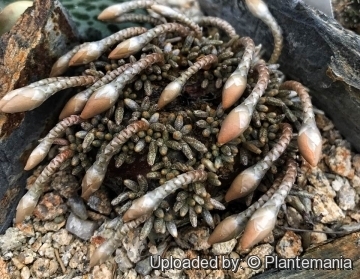 Avonia quinaria subs. alstonii (Schönland) G.D.Rowley: Flowers white up to 3 cm in diameter, leaves in 5 rows on the stem. 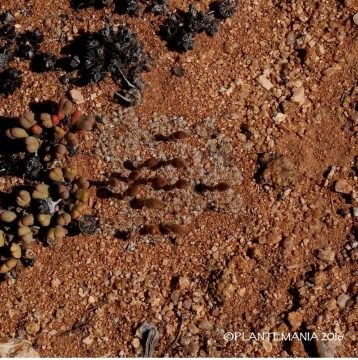 Distribution: northern Namaqualand, Cape Province, South Africa. Cultivation and Propagation: Although regarded as a choice and difficult plant, in cultivation it is relatively easy. It is a particular favourite of caudiciform plant enthusiasts. Growth rate: Plants grow very slowly and caudex take many years to enlarge. Clustering in cultivation, if grown correctly, it will reward the grower with generous displays of tiny flowers. Caudex exposure: The remarkable tuberous rootstock (caudex) is often raised 1-3 cm above the soil line so that this can be seen and more readily appreciated. For best results the tuber must be exposed only when plans become mature enough, usually after several years (8-12 or more years) of underground growth, as the exposed caudex will no longer increase in size once it has been lifted above the soil line. Hardiness: It is quite frost resistant if kept dry, hardy as low as -5° C. It can be grown outdoors in the summer months to benefit from direct exposure to light, and especially exposure to high summer temperatures. Recommended Temperature Zone: USDA 10-12. Sun Exposure: This plant has an excellent heat tolerance, and need full sun to light shade exposures. High levels of light are needed to flower and for good plant development. 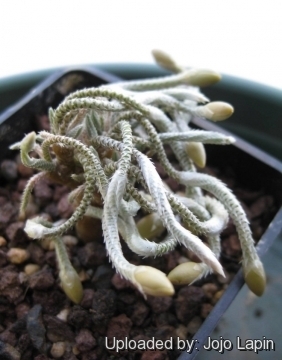 Rot: Rot it is only a minor problem with Avonia if the plants are watered and “aired” correctly. If they are not, fungicides won't help all that much. The plant turns immediately to mush when over watered, or watered out of season. Care must be given in watering, keeping them warm and wet while growing, and cooler and dry when dormant. Traditional uses: The dried and pulverized roots and stems were once used as yeast for backing bread and also to brew mead (Honey beer). The fresh corms were also used to treat diabetes they was crushed, boiled and ½ of a cup of decoction taken orally. Reproduction: The seed will loose viability in storage, and may not be viable the following year, so the seed should be planted as soon after harvesting as possible. Germination usually occurs within about a week or two. Seed germinate at 15-21 °C.